Elena Ferrante’s series traces the lifelong friendship of two impoverished Italian girls. The phenomenon came about quietly, with none of the attention often paid to hair-raising mysteries or sexual pyrotechnics. This unexpected literary success was mostly about women, like the books themselves. The popularity of the pseudonymous Elena Ferrante’s Neapolitan series of four novels, which trace the lifelong friendship of two impoverished Italian girls, has surged to unlikely bestseller status, largely by word of mouth from women readers who see some essence of their own lives in these works of literary fiction. Ferrante’s real identity is a much-discussed mystery. Lorenza Moronetti was so captivated when she read “My Brilliant Friend,” the first book in the quartet, that she had to talk to someone, anyone, about the striking tale. She started a Ferrante book club, which meets every other Saturday at I AM Books in the North End. This comes as no surprise to Nicola Orichuia, co-owner of I AM Books, who says novel sales are brisk, and nine out of 10 buyers are women. Brisk indeed. Without any major marketing campaign by Ferrante’s American publisher, Europa Editions, the quartet has sold 1.2 million copies in the United States to date since the first book was released in 2012. 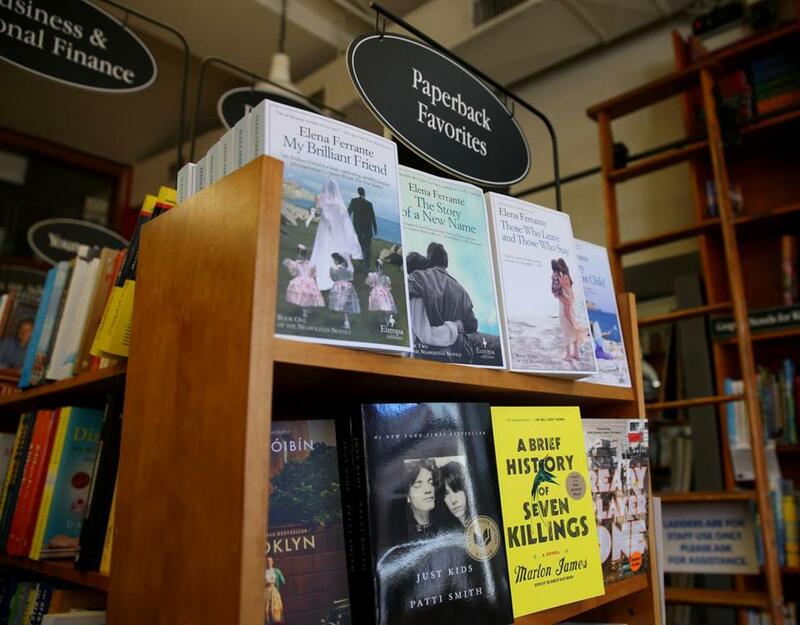 “My Brilliant Friend,” which is a bestseller four years after its release, was followed by “The Story of a New Name” (2013), “Those Who Leave and Those Who Stay” (2014), and “The Story of the Lost Child” (2015). Two of the novels are currently on The New York Times Bestseller List, and all four are in the top 10 on the New England Independent Booksellers Association Bestseller List. How rare is this? Publishing industry executives note that typical bestsellers tend to be widely accessible and offer more suspense or sizzle like Gillian Flynn’s “Gone Girl’’ or E.L. James’s “Fifty Shades of Grey.” This tale is about two ordinary women, is translated from Italian, and is written by an author who refuses to promote the books, insisting the writing should stand on its own. In the Neapolitan quartet, Ferrante’s protagonists begin as two girls in the 1950s living on the wrong side of the tracks in a society riddled with chauvinism, violence, and organized crime. The narrator, Elena Greco, escapes through education. Her brilliant friend, Lila Cerullo, remains stuck, despite teaching herself to read at age 3 and outshining all the other students in school. Readers follow the pair through decades of the exhilaration, disappointment, and tedium of marriage, children, and work. Beyond the story itself, Moronetti says she is also curious about the seeming similarities between Ferrante and her narrator. Both are named Elena. Both are writers. Both grew up in Naples. She also finds that the veil of secrecy around the author increases the intrigue. While all agree that women are clearly driving the Ferrante phenomenon, her fans are diverse. Reynolds says he has heard about African-American grandmothers discussing the novels passionately in Alabama and has seen well-heeled women on the Upper West Side of Manhattan flock to a Ferrante panel discussion. The popularity of the novels has not escaped the notice of media executives. A 32-part TV adaptation is being planned in Italy, and Reynolds, of Europa, says that “a very well-known American executive producer” is attached to the project, which suggests the series will be aired later here. Ferrante has fans among the glitterati and the literati alike: James Franco and John Waters are enthusiasts, as are Alice Sebold and Claire Messud. And Oprah, of course. That’s a harrowing statement, but its resonance for women is undeniable. Ferrante gives “female readers and writers the feeling that she is speaking to them and saying things that they have felt and not necessarily admitted to themselves,” O’Grady says. And they have found it’s something they want to share.